To day, We will see about the causes of bleeding on your gums when you are brushing the teeth. The bleeding in the gums or teeth is varies, some of them are temporary and some are dangerous. Well, if you are afraid of what you are experiencing, visit a dentist for appropriate advice or treatment. However, not wrong if you keep reading this article because we will discuss some of the causes of gums bleeding. Gingivitis is a dental disease that is still at an early stage. Plaque that is piled on the teeth and is not released when brushing teeth can cause gingivitis. The gums no longer stick strongly to the teeth because there is a buildup of plaque in between, this can cause bleeding when the gums are touched such as brushing teeth. Plaque can be formed when the way brushing teeth wrong, can also be caused by irregularity of the frequency of brushing your teeth. Always keep food scraps in the teeth because they can cause serious problems in the future. Brushing your teeth twice a day is an effective alternative to prevent gingivitis and plaque formation. 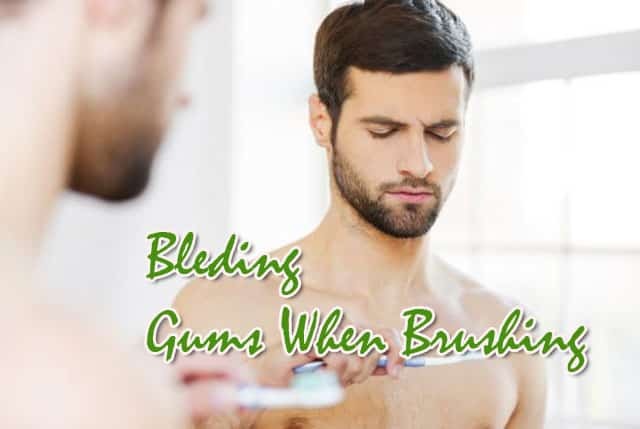 Bleeding in the gums when brushing teeth also occurs due to the factors of medicine. One is a blood-thinning medicine, it is certainly increase the risk of bleeding in the gums. Blood-thinning drugs are responsible for bleeding gums and are hard to freeze. So, if you ever take this medicine, tell your doctor about your medical history so you find the right solution. If you do not need to take blood-thinning medication, you should not have to try it. This drug is only for those who have problems with diseases such as stroke, heart attack, and other things that have the potential. Changing flossing regularly also causes the teeth to bleed. So if you have flossed before, but then forget or have not done it for a long time, then when you try to do again, bleeding can happen. Changing the way flossing can also cause bleeding gums. So do it regularly with the frequency you have set. If you often do it for 3 days once, then do it with that duration. So, flossing should be in accordance with the schedule you have set or your habits. Another thing that causes bleeding gums is pregnancy. This condition is called pregnancy gingivitis due to the usual body swelling. American Pregnancy Association informs that pregnant women experience a change in body response against gum bacteria. This process occurs because of hormonal changes in their bodies. Caution: Dental bleeding as it happens above can change its status becomes more severe. The best way to find out what illness you are suffering is to contact an expert doctor. Other causes of bleeding gums when brushing is a result of high sugar in blood. It is occurs in those who have diabetes or high blood sugar levels. This condition causes blood clotting to be difficult so that when the gums are slightly touched, the blood comes out immediately. Other causes of bleeding gums when brushing is a result of high sugar in blood. It is occurs in those who have diabetes or high blood sugar levels. This condition is very susceptible to gum bleeding because the blood is hard to clot.